?There is no question of personal courage in this war,? Colonel Patton?s commanding officer told him on the eve of battle in 1918. ?It is a business proposition where every man must be in his place and performing his part.? No one in the history of warfare was less likely to follow that advice than George S. Patton Jr. His place was in front of his men, and he paid the price, when he lay bleeding to death in a bomb crater in France. Patton?s survival that day at the end of World War I was nothing short of miraculous. It confirmed the powerful sense of destiny that guided him through three decades of war and made him a military legend? ?Old Blood and Guts,? an impossible mixture of irascibility and courage, profanity and profound religious faith, tactical impulsiveness and strategic genius. Blood and guts were indeed a large part of what made Patton Patton. Descended from an illustrious line of warriors, he was acutely conscious of the martial heritage in his blood. He met every challenge of his life with determination and guts. He demanded the same from his men, and he usually got it. But as Michael Keane shows in this masterly portrait, the foundation of Patton?s character was his vivid awareness of the presence and providence of God. Patton?s Christian faith was idiosyncratic, even unorthodox, but his habit of prayer was as simple, trusting, and constant as a monk?s. A singular combination of virtues and flaws, Patton has been venerated and despised but rarely understood. 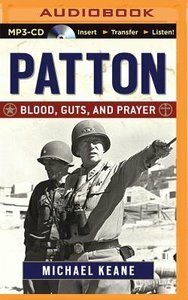 In Patton: Blood, Guts, and Prayer, Michael Keane penetrates the fog of legend and reveals as compelling a human character as any in American history.